Press Works has been busy the last few weeks preparing for our exhibit at the Paul Williams Gallery in Ontario. 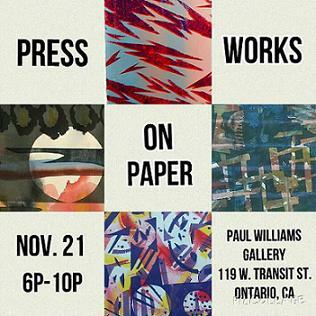 The Press Works On Paper Exhibit features artists Erin Morrison, Devon Tsuno, Claudia Morales McCain, and Mhiachnoiti. Join us for the opening on Saturday, November 21, from 6-10 pm.